The Sea turtles clinic, appointed by the Government Office for Environment, shelters and treats turtles found sick, wounded, mutilated or seized by the authorities. Two species of sea turtles can be seen at the clinic: the green turtle and the hawkbill turtle. Over 130 turtles have been sheltered by the clinic since its creation. 45 of them were successfully released back in the wild. 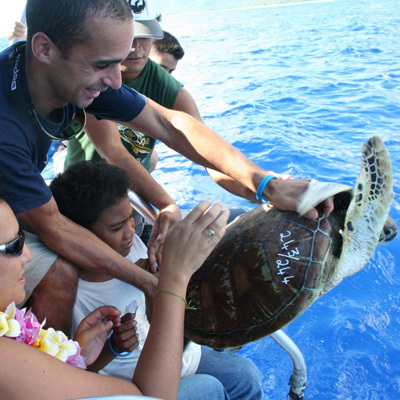 The Turtles Clinic is located in a dedicated area of the Hotel InterContinental Moorea Resort & Spa channel. The park is wire netted on each extremity and is composed of a rehabilitation lagoon and two enclosures called nurseries (one for intensive care, one for juveniles). The park is 50 meters long and 8 meters wide and its depth is of about 2 meters. The strong natural current of the area allows the continuous renewal of fresh water. The quality of the water is checked every month with a bacteriological analysis. PATA Foundation is proud to contribute our funding towards the construction of Sea Turtles’ House and production of Information Panels for visitors and tourists’ appreciation of the importance to protect sea turtles.